I love a big bouquet of Balloons. It is not always practical or cost effective to send balloons to someone, so a card with balloons is a great alternative. Punch 2 balloons in each of the following colors: Mint Macaron, Melon Mambo, Crushed Curry and Sahara Sand. Stamp sentiment from Balloon Celebration Stamp Set on Crushed Curry in Basic Black ink. 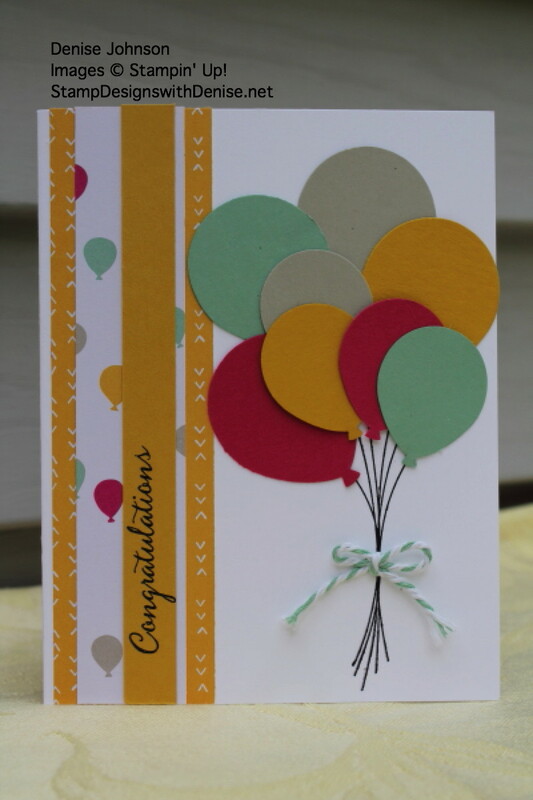 Stamp balloon bouquet stings on card base in Basic Black ink. Layer It’s my party paper and crushed curry with sentiment on left side of card base. Randomly attach balloons above strings on card base. Tie a bow with the twine and attach with mini glue dot to stamped string.